A food dehydrator is an incredibly useful piece of kit, allowing you to create your own dried fruits to put in cereals, jerky as a snack, dried vegetables for soup mix, dried flowers for art and even dried fruit puree to make into fruit rolls; a yummy candy-like snack for packed lunches. They also tend to save a huge amount of money as dried foods are expensive, especially jerky and certain fruits. Investing in a food dehydrator appliance will usually set you back between $40 and $70, but making your own homemade food dehydrator is also a very feasible option, and one that many people keen on dehydrating take. You can make a rudimentary dehydrator from a cardboard box, lined with aluminum foil and fitted with a light bulb and old computer fan. You can use wooden sticks as runners which will support the trays you use for your dried foods, and it’s easy to make air holes for ventilation in a cardboard box. Yet still, it often makes much more sense to create homemade dehydrators from something that will withstand the heat better, and will last you years rather than months or weeks. For one of these devices, you will need to fix yourself a cabinet made from any kind of wood that is in good condition. You can even use a bedside cabinet or small dresser, with the drawers taken out and replaced with shelves. What you use for your homemade dehydrator shelves is important; they need to be removable and easily cleaned (they get sticky when drying meat, fruit and veg), and they should have a few holes, but not big enough for food to fall through. The same mesh used in sieves is very good. If you have used wood for the exterior, then you will need to drill or cut holes in each surface to allow air flow. These should be no smaller than 1 inch across, and no bigger than 3. You may also want to cover them with mesh so that air can still get through, but bugs cannot. Once this has been done, you need to sort out your heat source. Placing your homemade food dehydrator in a warm place is not enough, so you will need to invest in some 60W bulbs and 100W bulbs. The sizes of homemade food dehydrators makes a significant difference to how many bulbs you need to use, so you will need to experiment. You can have them coming through from the bottom, side or top of the dehydrator – it doesn’t matter. It’s a good idea to keep a thermometer inside your dehydrator so that you can monitor the temperature and keep it to around 150 to 180 degrees fahrenheit to maintain dehydration, but not facilitate cooking. You might find that different types of food need different strengths of bulbs. 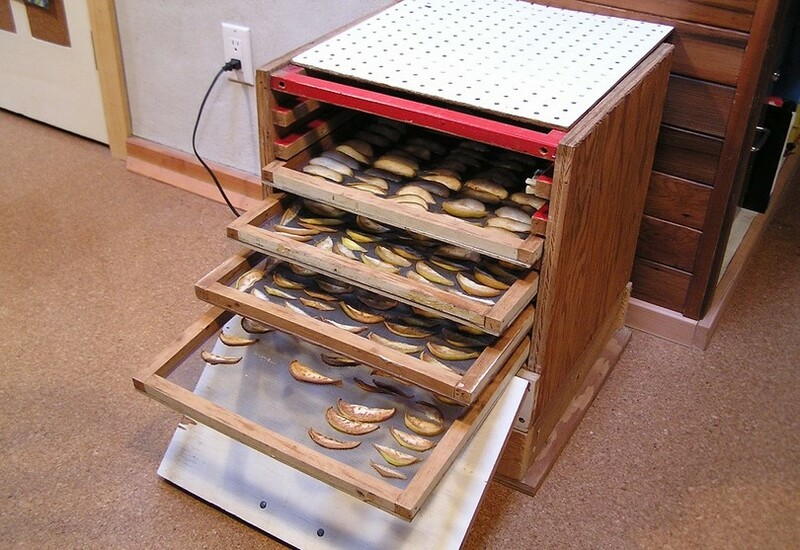 You should find from your homemade food dehydrator that the cost is greatly reduced from buying dried foods in store. What’s more, many people with homemade dehydrators say that jerky is of much better quality when it is dehydrated at home, over 3 or 4 days rather than just 26 hours.